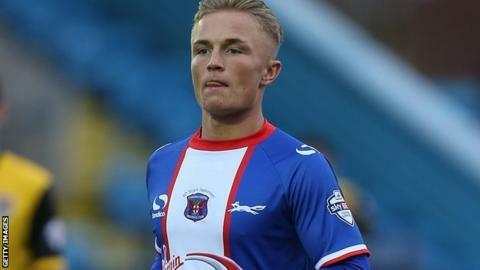 Carlisle staged a second-half comeback to take all three points against fellow strugglers Mansfield. The Stags snatched the lead in the last minute of the first half when Vadaine Oliver rose highest to head Reggie Lambe's cross in off the post. Carlisle deservedly equalised in the 72nd minute when home debutant Charlie Wyke slid the ball past Adam Smith. A quick break then left Mansfield short at the back and Wyke laid the ball off to Kyle Dempsey, who slotted home. Match ends, Carlisle United 2, Mansfield Town 1. Second Half ends, Carlisle United 2, Mansfield Town 1. Attempt saved. Reggie Lambe (Mansfield Town) right footed shot from outside the box is saved in the centre of the goal. Corner, Carlisle United. Conceded by Michael Raynes. Foul by Ritchie Sutton (Mansfield Town). Substitution, Carlisle United. Antony Sweeney replaces Charlie Wyke. Corner, Mansfield Town. Conceded by Mark Gillespie. Attempt saved. Matthew Rhead (Mansfield Town) header from the centre of the box is saved in the bottom left corner. Corner, Mansfield Town. Conceded by Matt Young. Attempt blocked. Billy Kee (Mansfield Town) right footed shot from outside the box is blocked. Substitution, Mansfield Town. Matthew Rhead replaces Junior Brown. Foul by Anthony Griffith (Carlisle United). Ryan Tafazolli (Mansfield Town) wins a free kick in the defensive half. Foul by Billy Kee (Mansfield Town). Goal! Carlisle United 2, Mansfield Town 1. Kyle Dempsey (Carlisle United) right footed shot from the centre of the box to the bottom left corner. Ricky Ravenhill (Mansfield Town) is shown the yellow card. Substitution, Carlisle United. Derek Asamoah replaces Steven Rigg. Goal! Carlisle United 1, Mansfield Town 1. Charlie Wyke (Carlisle United) left footed shot from the centre of the box to the centre of the goal. Kyle Dempsey (Carlisle United) wins a free kick on the right wing. Vadaine Oliver (Mansfield Town) wins a free kick on the right wing. Substitution, Mansfield Town. Billy Kee replaces Matty Blair. Substitution, Carlisle United. David Amoo replaces Brad Potts. Simon Heslop (Mansfield Town) is shown the yellow card. Attempt missed. Matt Young (Carlisle United) left footed shot from outside the box is just a bit too high. Attempt missed. Danny Grainger (Carlisle United) left footed shot from the right side of the box is just a bit too high. Foul by Michael Raynes (Mansfield Town). Attempt missed. Reggie Lambe (Mansfield Town) right footed shot from the centre of the box is just a bit too high. Corner, Carlisle United. Conceded by Adam Smith. Attempt missed. Brad Potts (Carlisle United) left footed shot from the centre of the box is just a bit too high. Matty Blair (Mansfield Town) wins a free kick on the right wing.